You think you know magic? Ha! Pulling a pointy cap over your head and wandering around town in your bed robe does not make you a wizard. I must admit the stars and moons are a nice effect, the better to warn others of the foolish thoughts rattling in your brain. You speak of magic, but you know nothing of pure power. Perhaps among the fools of this city you are numbered among the wise, but from where I come, you are an apprentice. Have you witnessed the power of the awakened eye? Have you seen a madness mage warp reality with the pure force of his twisted mind? Can you take a living creature as a sculptor handles clay and shape a being of your own design? The fleshmages of the Forbidden Wind can. So tell me wizard. What is it you know about magic? 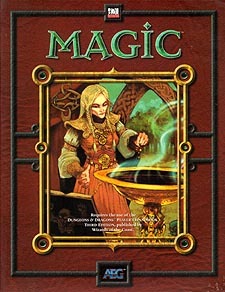 This sourcebook expands on the basic magic system used in fantasy campaigns to introduce a wide range of options. It introduces new classes that use magic in unique ways. It presents two completely new systems for handling magic - a spell point system that replaces the existing slot and level system, and a freeform system that allows you to craft spells on the fly. Additional rules allow you to customize magic items and infuse souls into artifacts. It's time to put the magic back in magic.